My new house guests, the irrupting Evening Grosbeaks, have settled in comfortably. We are slowly getting the hang of successfully meeting their dining expectations. This isn't easy as the reservations are usually for a flock of 50 or so birds. The feeders should be filled at night, so breakfast is ready when they get up. It disturbs them if they have to fly to the nearby trees and wait for breakfast. Once they have eaten their fill, birds of other species are allowed to join the buffet. 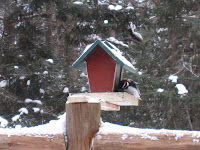 For example, today's blog star, Mr. Hairy Woodpecker was permitted this morning. The Chickadees, Titmice, Pine Siskins, Blue Jays and a lovely Pine Grosbeak were in town yesterday. As you might imagine, a party of this size can get a little raucous. There is the inevitable squawking and squabbling about position and hierarchy at the feeder. The resulting din is honestly very loud; I can hear it from most spots on the property. It is especially bizarre when the birds are yelling and there is training or competition at the 1980 Winter Olympic Bobsled, Luge and Skeleton track down the road. The announcer's voice sounds and feels like it is coming out of the trees, and it echoes a few times, adding to the creepiness. This is when I like to escape to the back country. However, there really are some cool events coming to the region this winter. I know I get lackadaisical about all this world-class competition, but that is only because I have lived here so long. If you've never seen a Bobsled, Luge or Skeleton (sliding sports) event, it is worth a trip to Lake Placid. There is a Luge World Cup scheduled for February 6-8, when town will be packed since it is also Lake Placid Loppet, a huge cross-country race, and full moon weekend. Then, later in February, Lake Placid will host the FIBT Bobsled & Skeleton World Championships. That sounds like a lot of announcing, so I know where I'll be most of those days!